If you are looking for a briefcase that is suitable for formal and casual purposes, then the vintage styled SOLO Classic Collection Colombian Leather briefcase might just be for you. Read on to find out in my review how good the quality is and how practical it is for an everyday carry. 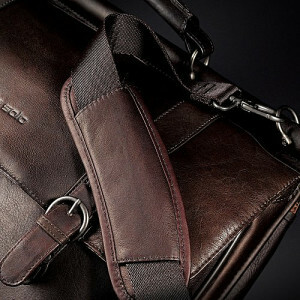 It’s formal and professional enough for work and business, yet casual enough for a fashionable out-and-about briefcase. The briefcase holds its shape well even when standing empty. 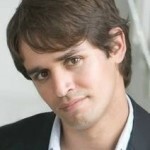 Due to its construction and design, contents don’t appear to bulge out much when overpacked. 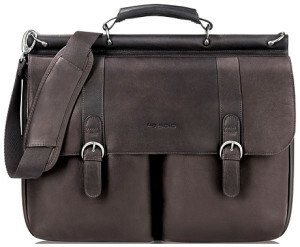 Very reasonably priced for such a well-designed and good quality briefcase. Not a lot of compartments. Slightly on the heavier side because of the material used. Dimensions (inches) - 16.5" x 13" x 5"
Taking on the appearance of a vintage briefcase, the SOLO Classic Collection Colombian Leather has a satchel type look to it and seems like something straight out an Indiana Jones movie. The dark brown full grain leather exterior is high quality and the rings that hold together the handle and shoulder straps are secured on tightly. 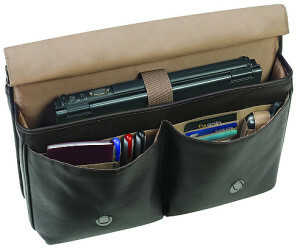 The exterior is constructed of high quality full grain leather which comes in a dark brown color (some pictures will show it to have a lighter brown color when this is not the case), and the flapover design is featured on the front and back of the briefcase with the edges being elegantly curved. To close the flaps securely, a pair of snap-buckles are used on the front while magnetic closures are used on the back. The buckles are purely just for show and cannot be adjusted either. A hard center panel is held up by a metal rod (where the handle and shoulder strap attaches to) which helps to maintain the bag’s form even when its standing empty. At the front center is the SOLO logo etched on deeper than previous versions of this briefcase, so you can see the logo better from different angles and in different lighting. This can be a good or bad point depending on your design preferences. You’ll also be glad to hear that the newer models of the SOLO Classic Collection Colombian Leather have improved quite a lot over older models. The rings that hold the shoulder strap and handle are narrower than before which means less friction and noise, and the screws that hold the rings in place are also much sturdier and tighter. Overall, it’s very well-constructed and its stylish vintage design makes it ideal for academics and creative professionals. Although I do believe that it looks smarter when carried by the handle rather than using the shoulder strap. As you run your hand over the full grain leather, it has a luxurious solid feel to it which makes it comfortable when you’re carrying it. And because it doesn’t bulge out much even when overpacked, it doesn’t feel awkward carrying it over your shoulder or by hand. With the amount of space you get, its side width is still only 5 inches. The shoulder strap feels better than most other briefcases around this price range because instead of using nylon, which is sturdier but irritates the skin more, it uses polyester like a car seat belt, which is smoother. The shoulder pad is made from leather and is slightly padded, while the handle is leather that feels sturdy and provides a good grip. However, it weighs 4.3 lbs which is slightly on the heavier side of briefcases, which is expected since there is a metal rod in place and a full grain leather exterior. Unfortunately there are no compartments on the outside which would have been ideal to keep items you need quick access to. When you open the flap covers, you’ll see that the interior is made from durable polyester (with a faint SOLO logo printed on) and not leather, which means that items are able to slide around easier. At the front, there are two large pockets which has holders for pens, business cards, a notepad and even more space for other accessories. Behind these pockets is the padded laptop compartment secured by a Velcro strap, and it can hold a screen size up to 16 inches. 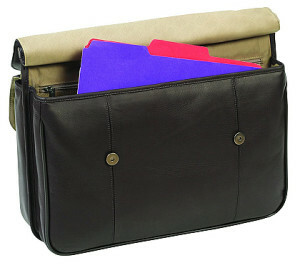 At the back is one large compartment designed to store your documents, books, folders etc. This section is also slightly padded. You’ll also notice the only zipper compartment on the entire briefcase. There isn’t much space in there, but enough to hold letters and thin notepads. Despite there not being many compartments, you can be sure that it’s spacious enough for everything you need on a day-to-day basis (unless of course, you carry a small library of books around with you). The lack of compartments doesn’t mean less space, it just means less separate spaces. Because all the main compartments are covered by flapover covers and not zips, there will be small openings at the side when closed which rain can get into. This may be something you want to bear in mind, though you should never allow any genuine leather to get wet in the first place. There really isn’t much you can complain about with the SOLO Classic Collection Colombian Leather Briefcase. It’s stylish, well designed and constructed, great to accompany you in different environments and all at a very reasonable price. If you’re drawn towards this vintage satchel styled briefcase, then you’ll be hard pressed to find a better one within this price range.